What you should do when a Georgia Bicycling or Cylcing Accident Causes a Broken Leg and The Need for Sugery. Broken legs happen when there is a traumatic incident such as a motor vehicle accident, 18 Wheeler Accident, and Bicycle Accident. More often than not, these accidents result in the diagnosis of Tibial Plateau Fracture. This occurs from axial loading force on the leg such as when there is contact with the bumper of car. Tibial Eminece fractures happen when the kneed is flexed. This happens when a person falls off of a bicylce and sustains a severe injury. 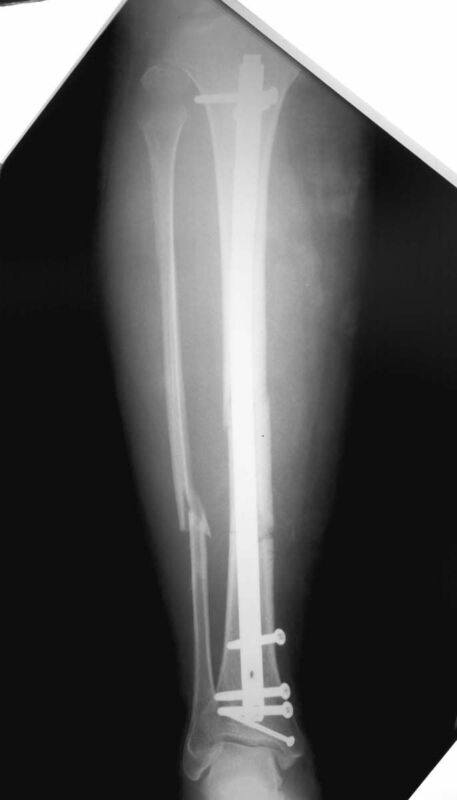 Tibial Shaft Fractures are the most common and usally involve the fibula as well. This is exactly what is demonstrated in the xray above. In this case, our client was struck by an automobile while riding her bicycle. Our client underwent surgery for and open reduction and internal fixation of left tibial platea fracture and open reduction an internal fixation of left ankle binnaffeolar fracture. Our client completed months of physical therapy and loss of quality of life. We were able to help our client successfully get back on her feet and sustain a normal quality of life. For more information please order our Free Book: Sharing the Road and Surviving the Crash.